Sports and betting are two of Australia’s greatest passions. No other nation loves a punt like we do, and few boast a sporting tradition as rich and diverse as ours. So it doesn’t take a genius to work out that sports betting is a pretty big deal in Australia. From football and soccer multis to cricket and tennis exotics to American and European sports, we as a nation will have a flutter on just about any code from any country worldwide. With so much demand for so many different pursuits, leading Australian bookmakers can’t help but offer thousands of wide-ranging sports betting markets seven days a week. Let us guide you through the near-endless options available at our top betting sites and show you how to get the most out of your Aussie dollar when having a punt on your favourite sports. There are several things you need to look out for when choosing an online bookmaker. A big spread of betting markets across all popular sports is an absolute must, but that’s only one part of the puzzle. – Is it licensed and regulated by an Australian state or territory gaming authority? – Does it use certified SSL (Secure Socket Layer) digital encryptions to protect your cash and personal details? – Does it support a range of fast and secure banking options for deposits and withdrawals? – Can customers rely on 24/7 support with dedicated hotlines for sports and racing enquiries? – Does it offer competitive odds on all major markets? – What kind of bonuses, promotions and betting specials does it advertise, if any? Fortunately, you don’t need to go far to find safe online betting operators that meet each of these key criteria. We at BettingSite.com.au only recommend sports bookies we trust with our own hard-earned cash, and each of these industry leaders fits the bill. BetEasy – The official AFL betting partner runs an enormous range of betting markets for all Australian and international sports, including Aussie rules football, soccer, rugby league, rugby union, cricket, tennis, golf, basketball and much, much more. The BetEasy Rewards scheme offers a smorgasbord of unique perks to both betting and non-betting members, such as live streams for several major sports. Sportsbet – Owned by Irish betting giant Paddy Power, Sportsbet.com.au is Australia’s most popular online sportsbook. It specialises in mobile betting with dedicated iPhone and Android apps and innovate sports wagering products such as the Sportsbet Multi Builder tool. Sportsbet customers can also enjoy regular specials and fresh promos every week, while new punters can score a $501 welcome bonus just for signing up. Palmerbet – The Palmer name has a long and well-respected association with New South Wales racing, but Palmerbet is no one-trick pony. The 100% Australian owned and operated bookie runs markets on everything from athletics to yacht racing, with a very healthy focus on Australian football and European soccer matches. If you want consistently superior odds and fresh betting specials every week, click this link to register at Palmerbet.com. Bet365 – One of Britain’s great success stories, Bet365 was born in a Portakabin in Stoke-on-Trent and has grown to become one of the world’s biggest and best online betting networks. This is the place to go if you want an exhaustive collection of soccer betting markets from Asia, Australia, Europe, South America and the United States, not to mention live streams from many of the most popular football leagues worldwide. From the wildly popular to the downright obscure, the best Australian betting sites operate markets on just about every sport imaginable. These are some of the biggest drawers at our trusted online and mobile bookies. Australian rules football – AFL betting offers enormous diversity, with in excess of 100 matchday markets available for every game and huge futures options for end-of-season events such as the AFL Grand Final, the Brownlow Medal and the Coleman Medal. State football leagues such as the VFL, SANFL and WAFL also see plenty of action. Rugby league – While AFL dominates the southern states, in NSW and Queensland it’s all about the National Rugby League. Major NRL and State of Origin betting markets include head-to-head, first tryscorer, winning margin and line bets, while NRL Premiership outrights and Dally M futures offer huge value for punters who get in early. Soccer – With a gobsmacking range of markets running for hundreds of leagues and tournaments all year round, ‘The Beautiful Game’ boasts the richest, most diverse betting scene of all sports. A-League, English Premier League, Major League Soccer, La Liga, Serie A, Bundesliga, FIFA World Cup, the Euros – take your pick. 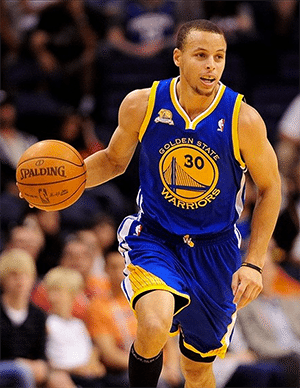 Steph Curry starred for Golden State Warriors on their march to the 2016 NBA Finals. Basketball – American sports have gathered a strong following in Australia in recent years, and none more so than NBA basketball. Internet bookies promote loads of NBA betting specials throughout the preseason, regular season and finals series, while there is also plenty of love for the Euro basketball leagues and the Australian NBL. American football – Punters can enjoy a broad selection of head-to-head markets, money lines, first basket bets and many more player props for all NFL games, Super Bowls and major college football fixtures. If you’re partial to a multi bet, the best NFL betting sites run a number of parlay bonuses throughout the regular season. Tennis – Both the ATP and WTP tours can claim a steady cult following year-round, but it’s during the Grand Slams that tennis betting really hits top gear. Punters can indulge in stacks of Australian Open, French Open, US Open and Wimbledon betting markets every year, especially for the hotly contested men’s singles titles. Cricket – Perhaps only soccer comes with a more expansive range of betting options than cricket. Test matches, ODI series, T20 cricket betting and the myriad first-class and domestic limited-overs competitions in play worldwide provide huge punting opportunities all year round. Golf – Much like tennis, golf betting enjoys massive peaks during the US Masters, the British Open Championship, the US Open and the US PGA Championship. There are many more high-profile tournaments besides the majors, however, as international team events such as the Ryder Cup and the Presidents Cup also do a roaring trade. Formula 1: – While it’s not as prominent as it used to be, F1 racing still has its fans, and attracts huge sponsorship dollars. The World Championships compromises of over 20 Grand Prix events held all around the world and includes renowned drivers like Australia’s Daniel Ricciardo. Mixed martial arts – The rise and rise of the Ultimate Fighting Championship has transformed MMA from an intriguing sideshow into one of the world’s fastest-growing sports. UFC betting offers a suitably exciting set of straight wagers, exotics and props to match, especially for those star-studded UFC Main Event cards. If you’ve never made a sports wager online before, the sheer weight of options can be overwhelming at first. Many are self explanatory, but others aren’t quite so easy to work out at a glance. Here is a quick outline of the most popular betting categories offered by leading internet sportsbooks. Head-to-head – This is your bread and butter bet. All you have to do is pick which team, player, fighter, racer, or miscellaneous competitor will win any given contest. Simple enough, but never as easy as it sounds. In sports where tied results are common, such as soccer and Test cricket, this is offered as a win-draw-win market. Handicaps and line bets – In handicap betting, a particular team or outcome is given a par score which must be met or exceeded in order to win. For example: if GWS Giants have a -12.5 points line, the bet only pays if they win by at least 13 points. There are also over/under lines for things like the number of match goals in soccer and first innings totals in cricket. Exotics – This category covers a wide variety of betting options that don’t rely solely on the overall outcome of a contest. These can be as common as the set betting markets in tennis, or as niche as the total number of corner kicks conceded in a soccer match. Player props – Many sports feature exotic bets (also known as ‘proposition bets’ or ‘props’) that focus specifically on the performance or accomplishments of individual players. The first goalscorer markets in football betting are prime examples, as are the top runscorer, top wicket-taker and man of the match wagers in cricket. Double bets – Soccer bookies have a special fondness for tying two single bets together to form a doubles market, which only pays when both halves of the wager get up. For example: a half-time/full-time bet on Manchester United/Manchester United wins only if the Red Devils lead at both the halfway mark and at the final whistle. Future markets – Sports bookies often put up early odds for events that won’t be decided for several weeks, months, or even years. This is most common with major international tournaments such as the FIFA World Cup soccer, where you can bet on the outright winner, finalists, group qualifiers, top goalscorer and many more potential outcomes before the finals even begin. Multi bets – Multiple bets, or parlays, feature several single wagers combined into one. All ‘legs’, as they are commonly known, must win in order for the multi wager to pay; if even one leg fails, the bet loses. These are hugely popular, especially footy multis and soccer multis, as the extra risk also means far greater rewards. Which online bookies offer live sports streaming? Don’t have Foxtel or Optus Sport? Away from home and can’t get to a TV? You’re in luck, because a number of Australian bookie sites provide a live streaming service so you can watch your favourite sports in real time on PC, Mac and mobile. BetEasy – Live Vision streams every match of the AFL Premiership season to smartphone and tablet devices, as well as NBA, soccer, tennis, cricket and Australian racing. Sportsbet – Tennis, soccer, darts, Victorian racing and many more local and international sports are available for live streaming online at Sportsbet.com.au. Bet365 – This is the place to go for live soccer streams from Europe, South America, the UK and the USA, as well as basketball, tennis, darts, volleyball, ice hockey and much more.